Ancestral Links, by John Garrity. Published in 2009 by New American Library. The best golf writing maneuvers along a treacherous ridgeline separating the chasm of sentimentality from the gorge of self-indulgence. There’s something about golf that gets the sap rising. In Ancestral Links, John Garrity had to tread with special care, because his themes normally come pre-slathered with schmaltz, to wit: a dear departed but occasionally impecunious and complicated father; the illness and death of an older brother; and memories of his parent’s divorce when he was a boy. This rich emotional material is squeezed into the narrative of a long, reflective golf-rich sojourn to the Irish town of Belmullet. The nearby “bleak, lonely Mullet Peninsula,” was the point from which his great-grandfather, Michael Garrity, had paddled out to sea on his way to board a ship for America. (On arrival, he somehow flushed all the way inland to western Wisconsin.) That Garrity negotiates this terrain with modesty and good humor, gathering a feast of delightful stories, is a testament to his reporting skills and to his courage, which is what it takes to face the past without inventing a narcissistic, self-justifying present. Garrity always assumed that his golfing gene came down to him from his Scottish, Stuart ancestors, not from the Irish refugees launched on their journey by famine and despair. He knew nothing of County Mayo or the wonderful golf course there until his good friend, the American golf course architect Jim Engh, mentioned in passing that while Ballybunion, which every golfer knows, was his favorite course, a “close second” was Carne, in Belmullet. 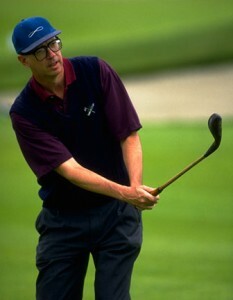 Garrity had been to Belmullet in 1989, but remembered only a “rudimentary” 9-hole inland course, not a classic links. That’s because Carne’s first 9 didn’t open until 1992, and the full 18 wasn’t ready to play until the next year. One of the pleasures of Ancestral Links is Garrity’s account of Carne’s creation, a shoe-string enterprise that depended largely on the support of the local tourism authority, the dedication of a committee of local golfers, and perhaps above all to the generosity of Carne’s designer, Eddie Hackett, referred to by the American golf writer, Richard Goodale, as “the godfather of Irish golf course architecture.” (In addition to Carne, Hackett designed Ballyliffin, Rosapenna, Donegal, Enniscrone, Connemara, Ceann Sibeal and Waterville. Goodale’s appreciation of Hackett, “Desperately Seeking Eddie Hackett,” appeared in Issue 13 of Golf Course Architecture, July, 2008.) 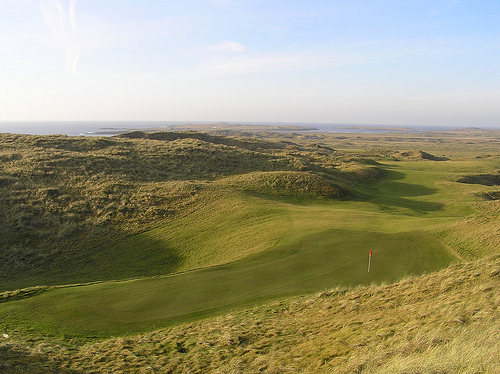 Most of his work has been modified, but Hackett’s courses form the backbone of Ireland’s best modern links. Tom Garrity was able to visit and play Carne with John, and felt a particular affection for the 17th hole, a treacherous and demanding par 4 of 436 yards. “You drive over a gully to a fairway that rides a ridge and bends to the right around a plateau of shaggy moguls,” Garrity says of 17. “The green hides behind these mounds, the only hint of its existence being a solitary sand bunker set into a distant hillside.” It was Tommy’s idea to play an entire “round” on 17, hitting three tee shots in each sequence, then play them out and return to the tee five more times, thus playing 18 holes. Garrity writes that “the idea grabbed me the moment I heard it,” thus providing a leitmotif that sounds throughout Ancestral Links and supplied its narrative glue. Tommy, who imagined the 17thhole quest but never got to try it, thought 80 would be a good score, but after all, he had been a touring professional. John, who plays to a 12, set as his goal breaking 90. Introducing us to the locals, who note that his height (Garrity’s 6’7”) and “good looks” are common among Garrity men (who spell the name “Geraghty” in Belmullet), Garrity paints a convincing and enlightening portrait of the small Irish town where he’s taking his sabbatical. He also demonstrates what an important role Carne has played in resurrecting the local economy—something similar in character if not in scale to what Mike Kaiser did with Bandon Dunes in southern Oregon. Garrity finished the book before Ireland’s property collapse summoned the ghost of gloom from the graveyard where contemporary Irishmen had hoped to inter it permanently. Still, Carne has been an enduring success, and later this year a third nine, designed by none other than Garrity’s American friend, Jim Engh, one of the best in the business, will open. You can see photos on Carne’s website, and if you love links golf, you will surely salivate at the prospect of playing all 27 holes. In the meanwhile, spend a few hours in the pleasurable company of Ancestral Links, a perfect companion for anyone contemplating a trip to golf’s most enthralling province, the west coast of Ireland. Ancestral Links deserves a spot on the shelf of the best golf books ever written, next to Garrity’s Sports Illustrated colleague Michael Bamberger’s To the Linksland, and James Dodson’s Final Rounds.